Last week Major League Baseball announced some new pace of play rules. Essentially, mound visits are going to be limited to six per nine innings, but there will be no pitch clock, as had been threatened earlier in the winter. Pace of play has been an issue with baseball for some time now. If you watch an old MLB game from before 1990, you can’t help but notice how much more crisply the game flows. Usually it’s over in about two and a half hours. Today you’d only be in the sixth inning. I recently went to an NBA game—my first in over 20 years—and I admit I enjoyed the experience. I especially enjoyed that the game was over in about two hours and fifteen minutes. That was long enough to feel like I got my money’s worth, but not so long I felt I was becoming part of my seat. But as is typical with MLB Commissioner Rob Manfred’s ideas to improve pace of play, this latest rule change is a stupid idea. Manfred has been fretting about the pace of play in MLB games since he became Commissioner, which I agree is a problem. But Manfred has a unique gift of selecting the absolute worst solutions instead of implementing obvious ones. One need look no further than his “Texas tiebreaker” idea: start extra innings off with a runner already standing on 2nd base. I hated that idea when my 10yo daughter’s softball league did it, so I can’t see how it will be any better in the Major Leagues. Both of these solutions—mound visits and runner on 2nd—are typical of Manfred in that they don’t actually address the problem, but give the appearance of doing something. 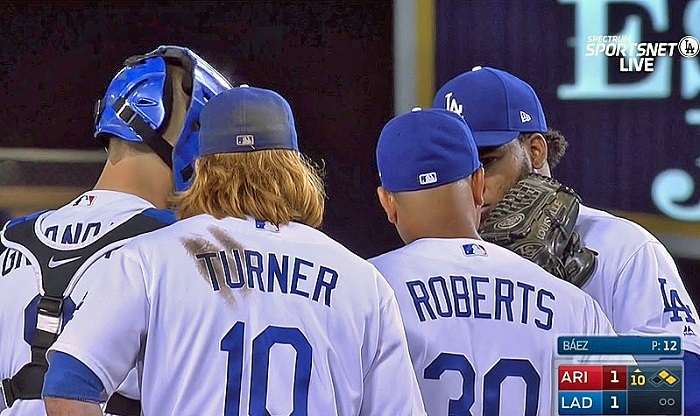 Other than in the playoffs, mound visits aren’t really a problem. I agree that in last year’s playoffs I wished Gary Sanchez was bolted down behind home plate, but I never really even noticed mound visits during the regular season. And placing a runner on 2nd in extra innings is even more idiotic. The problem with MLB games isn’t too many extra inning games, it’s the pace during the innings. In fact, most baseball fans enjoy a good long extra inning game every once in a while, especially if the first nine innings only took two and a half hours to complete. But if the first nine innings go three and a half or four hours, sure, nobody wants to continue that agony. Again, though, I agree that pace of play has become a problem. So what changes would I make if I were Commissioner? I think three simple ones would make a world of difference. The first thing you notice when watching an old MLB game is the limited time between pitches. The pitcher will deliver the pitch, the catcher will throw it back, and a few seconds later, the pitcher is starting his delivery again. The batter barely moves between pitches. Of course today the typical MLB batter needs at least a minute between pitches to adjust his jockstrap, take his batting gloves off, wash them, and then put them back on again, switch helmets, and make plans for dinner later that night. A few years ago the League made a rule that a batter couldn’t leave the batter’s box between most pitches, and this was tepidly enforced for a few weeks, then forgotten. But it’s still on the books. It needs to be enforced. Strictly. If a batter steps out of the box between pitches, then a strike should be called by the umpire. Perhaps give them one warning. This one rule would do more to speed up the game than any other possible change. (Note: there are certain situations of course where a batter can legitimately leave the box, such as hitting a foul ball, getting brushed back by a pitch, etc. But common sense can prevail here). I’m a baseball traditionalist, so I get the argument that “there’s no clock in baseball”. That’s fine when players are being reasonable about their between-pitches routine. But when Pedro Baez takes more time between pitches than I take to mow my lawn, something has to change. A pitch clock is needed to limit the damage. I think 20 seconds between pitches is reasonable, and would go a long way to moving the game along. If I’m honest, what I’d really like to do is get rid of instant replay. I hate it. But I’m willing to compromise with the spirit of today’s game and allow it. But there needs to be a one minute limit for review. If the officials in New York can’t figure if the call is right or wrong in one minute, the play is close enough that a wrong call doesn’t matter. Calls shouldn’t be studied in more detail than the Zapruder film; instant replay should just be a way to reverse egregiously wrong calls. And it’s not like the current system of taking as long as possible always results in the right call. There are at least a few times a week they obviously blow the call even after reviewing the films for five minutes. So let’s put a limit on how long they can review. The biggest obstacle to implementing pace of play rules is the players. They rightly don’t want the game to change. But they need to realize that they are the main problem, and so they can be the solution. Two of the three solutions I give above aren’t even necessary if players would be reasonable with their between-pitch activities. If they don’t police themselves, they’ll face the Wrath of Manfred. So, for the sake of fans everywhere, batters just get in the box and pitchers just pitch the damn ball.